John Thomas Duckworth was born on February 9, 1747/48 in Leatherhead, England and joined the Royal Navy by age eleven. He became a lieutenant in 1771, captain in 1780, and in 1793 commander of the Orion, 74 guns. In 1799 he was promoted admiral of the white. 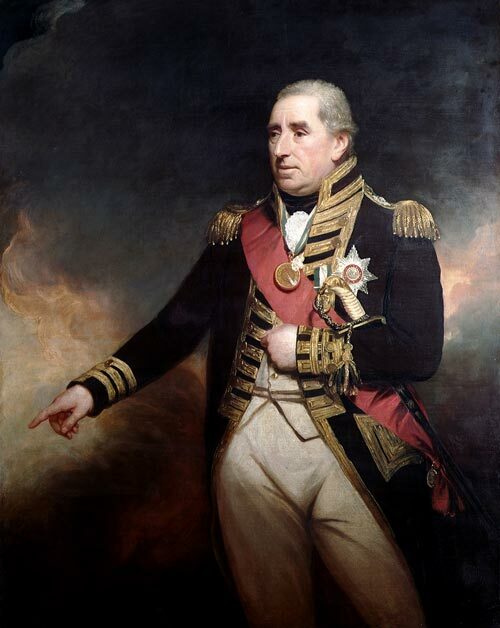 In 1800 he captured a rich Spanish convoy off Cadiz. Duckworth was knighted in 1801 and was promoted Vice-Admiral in 1804. On March 26th, 1810 Duckworth was appointed commander-in-chief and governor of Newfoundland, and promoted to full admiral. In 1811, new British legislation allowed fishing ship rooms in St. John's to be converted into private property. Duckworth had the lands surveyed and let at auction in 30-year leases. He insisted that buildings on these lands should be of stone or brick, and the streets of proper width. Though he realized that the old fishery laws were obsolete, Duckworth did not believe that a legislature and full colonial government were necessary. He therefore opposed the ambitions of the St. John's elite, and denounced Dr. William Carson's radical pamphlets. On the other hand, Duckworth encouraged church building, enlarged the Anglican church in St. John's, and actively tried to attract more Anglican missionaries to the island. He also supported the building of a public hospital. Duckworth is recognized for his persistent attempts to rescue the Beothuk. He offered a reward to anyone making peaceful contact with them, and sponsored Lieutenant David Buchan's expedition up the Exploits River in 1810 to meet them. War with the United States in 1812 spurred Duckworth to revive the militia, renamed the St. John's Volunteer Rangers, to protect the city. The outports were prepared as well, and only a few communities were attacked by American privateers. Duckworth left Newfoundland in October 1812 and became a member of parliament for New Romney. He became a baronet on November 2, 1813, and commander-in-chief of Plymouth naval base in 1815. He died in August, 1817.